Last year I was involved in publishing two anthologies – Lost in the Museum and The Best of Twisty Christmas Tales – which sucked up a lot of my writing time. This year I have some exciting news. I’ve been asked by a publisher to write a couple of kids’ novels for their You Say Which Way series. These are interactive e-books, similar to Choose Your Own Adventure or Pick a Path stories, where kids choose which way the story goes. I’ll have more exciting news about these soon. I am also finishing a kids’ novel and rewriting a young adult paranormal romance that has been on the back burner for over a year. So it’s exciting and busy! I thought I’d keep everyone up to date on my progress with my new word meters in the sidebar – a cool way to let my readers know what I’m up to. These word meters will be updated as I make progress. Progress as at mid July 2015. To be updated soon! Black Belt Bailey – a middle grade martial arts novel for 11-13 year olds – is complete at 38,000 words. 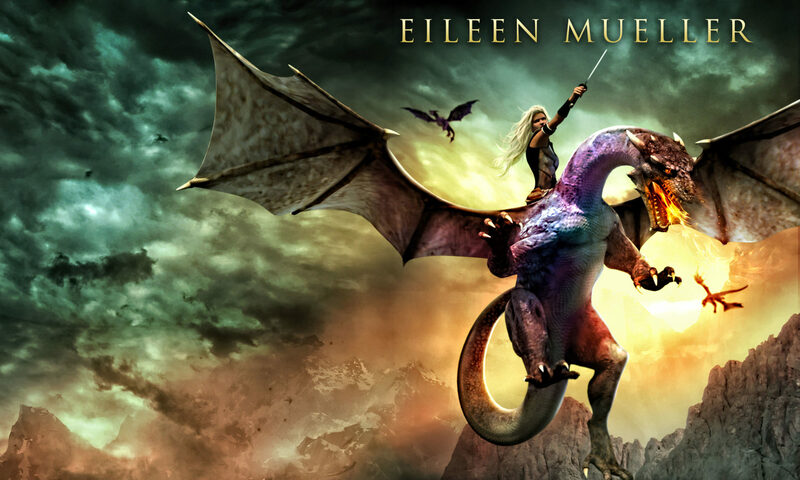 The first draft of Dragon’s Realm – the first of my You Say Which Way adventures – is finished at 42,000 words. This was fun to write and I look forward to receiving feedback from the publisher soon. Nymphyre is a YA paranormal romance that has been brewing in the background for a couple of years. It was at about 92,000 words, and I’m whittling it down to about 80,000 (currently 87,000 and shrinking.) Written in fits and starts between other projects, this novel needs a through rewrite! I usually write a novel from start to finish, not over two years, so it’s been really interesting to rewrite this, bringing all the scenes into line with how I now want to the story to run. Clarkes’ Critique Group have taken my innocent sentences twisting them with their risque humor, making our local library cafe ring with laughter for hours on end as we chortle over possible romantic twists! Luckily most of these ludicrous suggestions will remain in the cafe – although their sound story-crafting ideas have been steadily worked into the novel. What is it about romance that makes people giggle and come up with silly jokes? Monkey Lab, my other critique group have also enjoyed aping around with the story! Lots of grunting & screeching during those critique sessions – think chimps at the zoo. Mystic Portal is a project planned for later this year, another You Say Which Way – a mountain biking adventure with a twist! Or several twists, depending on which paths you choose! I did not want the names and word counts to take up too much space on my sidebar, so I decided to have meters with the words and count inside them. I wanted to reflect which phase of the writing process I am at with each project , e.g. draft, editing, 2nd draft, rewrite etc. This site enabled me to do all of the above. I inserted the information I wanted (Project phase, name and target word count) inside the caption field. I decided to use blue for finished phases of projects and red for unfinished phases. I copied the code into one text box plug-in, in my sidebar, to create the word meters you see now. I repeated this process for each project, and saved my code in a word document for easy access (so I can edit the source code instead of using the site, next time). Enjoy popping by the blog to see my progress. It’ll be nice to see you. Now, I’d better get back to writing or I’ll never be able to update the word meter. See you soon. I know many of my readers are overseas and are unable to get to The Best of Twisty Christmas Tales book launch in Wellington. So here’s the good news: We’re having an online e-book launch throughout Friday. There will be giveaways, prizes and lots of online fun. Kids will love Geoff Popham’s fun Twisty Christmas cards. Christmas Tales e-book now, and email your receipt to phantomfeatherpress [at] gmail [dot] com (use the correct symbols please) to go into the draw to win e-books, Twisty Christmas cards and other cool prizes! Here’s the Amazon link again! If you use Facebook, join the event, and keep up to date with winning opportunities. The dust has finally settled after Storylines Family Day, and Christmas is just around the corner. But I have a confession to make: I’ve been wearing my Santa hat for months, editing The Best of Twisty Christmas Tales! Last year Peter, Alicia and I put out a small e-book of ten Christmas stories as a trial for a larger project. Now that larger project is nearly complete! The Best of Twisty Christmas Tales features 31 crazy Christmas capers from 27 authors, including iconic kiwi authors Joy Cowley and David Hill, best-selling sci-fi author Dave Freer, stacks of kiwis and an Aussie or two. 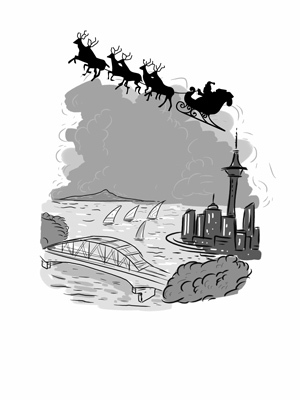 Santa over Auckland by Geoff Popham, in The Best of Twisty Christmas Tales. Check out the awesome list of authors in our new kids anthology here. It’s going to be a Twisty Christmas! It’s been an amazing experience to edit this anthology, along with Alicia Ponder and Peter Friend. So many great stories, so many talented authors, so much fun, and so much hard work! As well as all the other projects I’ve been working on! If anyone has a cloning kit, similar to one that gets used in Santa’s workshop in one of our Twisty stories, then I would gladly borrow it, just to get everything done. Or perhaps not, after all, I know what havoc resulted when Santa’s elves tried it! The Best of Twisty Christmas Tales is available in good NZ bookstores and on Amazon from late October.